Deon Moore on the attack for Posh on his debut against MK Dons. Photo: Joe Dent/theposh.com. Peterborough United manager Grant McCann rarely raises his voice. He’d be a librarian’s dream customer. And to to be fair he didn’t shout and scream after his team’s pitiful Checkatrade Trophy capitulation at the ABAX Stadium last night (October 4), but his fury was still obvious. You could see it in his eyes as he condemned a lack of heart and commitment from his players who were lucky to lose by just one goal to MK Dons, fierce rivals in recent seasons, but given a free pass into the knockout stages of this unpopular competition last night. Posh midfielder Gwion Edwards goes in for a header against MK Dons. Photo: Joe Dent/theposh.com. McCann had steel as well as style in his playing days - he was sent off a couple of times in his Posh career for wicked fouls - and a naughty step already containing a couple of playeres ruthlessly discarded for under-performance could well be full up by the end of today’s recriminations. The Checkatrade Trophy is rightly unloved. It’s a dismal, long-winded, unattractive formula and the early departure itself will not be mourned for long, but the manner of the exit was still worrying. Humbled 6-1 by a bunch of Canary kids in the opening fixture at the ABAX, Posh’s fate was sealed by a 1-0 home reverse at the hands of an MK Dons’ side that showed seven changes from their victorious League One side from the weekend. And the margin of victory greatly flattered Posh. Only some fine goalkeeping from on-loan Spurs number one Luke McGee stopped another crushing Checkatrade defeat. Posh made four changes to their last League One starting line-up, but the visitors retained a proven League One goalscorer up front, while Grant McCann handed a first start to a 17 year-old striker. The team selections were telling by half-time as Kieran Agard missed one great chance two minutes before opening the scoring for the visitors in the 40th minute, while teenager Deon Moore had no more joy than regular starter Tom Nichols at affecting the play. 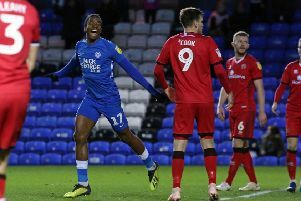 Posh enjoyed some bright moments, usually when Gwion Edwards or Marcus Maddison were bursting down the flanks, but obvious goal-scoring chances were absent in the opening 45 minutes. Maddison forced two parried saves form reserve MK ‘keeper Lee Nicholls, but it was a strong tackle on the Posh talisman by outstanding visitor Brandon Thomas-Asanti which led to the only goal. Thomas-Asanti carried the ball forward, played it to Samir Carruthers who smartly squared for Agard who had the simplest task of converting into an empty net. Agard had shot wide when well-placed minutes earlier after a quickly-taken free kick and Ben Reeves had forced a fine save from McGee after Posh had again been cut open down their right hand side. Agard should have extended MK’s lead in the opening minute of the second-half and then McGee showed terrific reflexes to thwart Ben Reeves, Dean Bowditch, Thomas-Asante and Goirgio Rasulo before Posh staged a late rallyt. In the last 10 minutes, central defender Tafazolli headed wide from a corner, substitute Nichols robbed a dithering goalkeeper before firing into the sidenetting and Nichols then headed Maddison’s fine cross wide when he really should have scored. The Posh problems of careless defending and a lack of finishing ability may be the same, but they are mounting up. Posh haven’t won since beating a much stronger MK side away from home on August 27. That was a much more important game, but it seems like an awfully long time ago. Posh: Luke McGee, Hayden White, Andrew Hughes, Jack Baldwin, Ryan Tafazolli, Chris Forrester, Leo Da Silva Lopes, Gwion Edwards (sub Paul Taylor, 46 mins), George Moncur (sub Nathan Oduwa, 81 mins), Marcus Maddison, Deon Moore (sub Tom Nichols, 61 mins). Unused substitutes: Mark Tyler, Michael Bostwick, Callum Chettle, Jerome Binnom-Williams. MK Dons: Lee Nicholls, George B Williams, Paul Downing, Jack Hendry, Ben Tilney, Ed Upson, Samir Carruthers, Dean Bowditch (sub Ryan Colclough, 76 mins), Ben Reeves (sub Giorgio Rasulo, 71 mins), Brandon Thomas-Asante, Kieran Agard (sub Kabingo Tshimanga, 67 mins). Unused substitutes: Charlie Burns, Callum Brittain, Joe Walsh, Oran Jackson. Goals: MK Dons - Agard (40 mins). Cautions: Posh - Oduwa (unsportsmanlike conduct).